A Moz Pro subscription includes: access to site tracking with Campaigns, where you can learn how your site health, link building, and keyword performance impact your SEO success; Research Tools that analyze your competitors efforts, support your keyword research process, and show you new opportunities for link building outreach; and a wealth of resources for learning SEO and inbound marketing. Moz Pro starts at $99/month with the option of a free 30-day trial. Moz Pro Reviews Recently Reviewed! Pros: MOZ is a solid SEO monitoring tool that we will likely continue to use. It provides keyword tracking but takes it a step further in a couple of ways. The system provides a metric called Search Visibility. This score can either be applied to all of the keywords that are being tracked or just the keywords within a user controlled category. So this helps us understand how the site is performing but also individual product categories. We are also able to see how three competitors compare. The system is junk in, junk out. So if you don't track the right keywords, then you aren't going to get good information. But if used appropriately, you likely won't find a better system for the money. Cons: As of the Summer of 2017, the company has fallen behind some of its competitors. Not to the point that we are going to make a switch. But we do have smaller subscriptions to their competitors to take advantage of all systems. MOZ has really fallen behind in two ways: Domain Authority and Backlinks. Overall: This system monitors keyword performance, provides several useful SEO metrics, and also makes those metrics available in a browser toolbar. I would say MOZ is easily in the top two SEO tools available. 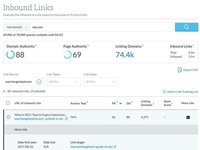 Pros: Moz includes the most important features you expect from an online SEO tool. Backlink analysis, keyword tracker, domain analysis, onsite and offsite SEO, organic traffic analysis, and competitor analysis (just SEO). That's why I call is a must-have app. I've used many other SEO apps (such as SEMRush) and the majority of them are helpful but only for your research stage. After that, you will end up paying for features that you won't be using that much. Plus, Moz pricing has been same for a few years now. Cons: There is a section for "insights" to help users understand a few actionable tasks to improve their website SEO score but at this point, Moz's "insights" is premature. Reporting is not a decent feature in Moz. You will find some options for PDF exports but most important charts are not supported and you can only export CSV files and then make similar charts yourself. 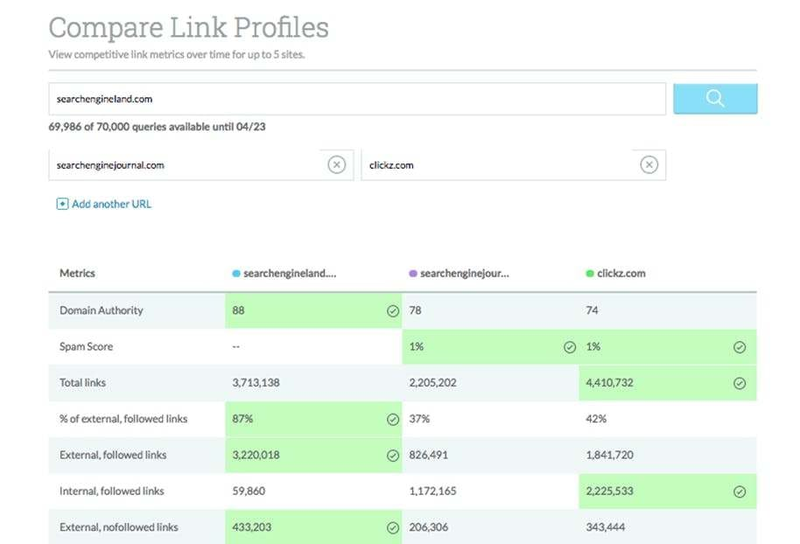 Pros: Moz Pro is a comprehensive SEO tool for marketers like myself, and it packs a ton of features like keyword explorer and backlink checker that are an absolute must for crafting any digital marketing strategy. I'm probably in these two tool sets the most, and I love Moz Pro's Keyword explorer more than any other SEO software I've tried. The Keyword explorer helps you find both short and long-tail keywords that are profitable in your desired niche, and helps round out your keyword strategy with lucrative or hidden keywords that you may not have known about before. This helps you craft blog posts and put those keywords you just found through Moz Pro to gain new traffic through organic (or paid) search. Cons: Moz Pro and (SEO) requires a lot of patience and a bit of knowledge in what SEO, keywords, SERP really is before you get the maximum benefits of Moz Pro. I wouldn't recommend the Pro version to anyone before they try out Moz standard version or at least do a bit of reading in SEO. It took me about a solid 2-3 months of really putting Moz Pro to the test before I understood everything. Overall: Moz Pro packages the entire software into a beautiful UX/UI with awesome data visualization, which is extremely helpful for me to look through the data without feeling frustrated on 'what am I really looking at?' Moz Chrome Extension is a great tool for getting things like Page Rank and SERP standing, which helps me identify how my competition is doing and prospecting new leads. Would only recommend Moz Pro to the seasoned professional who understands SEO. Comments: MOZ.com (formerly SEOMoz.com) provides SEO software, tools and training. What I like most about MOZ is that I trust their results. Additionally, I always look to their thought leadership and training on any topic related to SEO, SEM, PPC, Keyword Research, Local SEO, etc. Cons: MOZ, although feature rich, is somewhat expensive for the base package. If you want the other modules like Keyword Research, Backlink Reports, Local SEO, you have to pay extra for each. Recommendations to other buyers: MOZ is a sophisticated SEO suite. If your budget doesn't justify their pricing plans, there are numerous other tools, websites that can provide very good alternatives. Pros: Moz Pro is not only a software, but also a self-performance examination tool, which has given me some commendable insights into my content. Moreover, its special feature- Keyword Explorer has been working wonders for me. Being a content writer, it helps me stay connected to the identical pertinence and structure, to each content that I draft. Cons: On a bigger front, I really cannot fish for any cons for Moz Pro. But I would like the concerned authorities to kindly allow the other nations apart from the U.S. to access the database/crawler/metrics. Overall: As discussed above, Keyword Explorer is my favorite of all its features. My contents backed with the keywords researched by employing this tool has really helped me rank my page. Furthermore, the suggestions advanced by Moz coupled with SERP analysis serves as a complete package to inspect the performance of my work. Pros: Fantastic rank tracking and competitive analysis reports. Cons: Clunky, slow, forced design language and expensive. Overall: Long time (happy) customer. They seem to have nailed the rank tracking and their index is average compared to others like ahrefs. Really shines when it comes to competitor analysis in the organix space. Absolutely essential for organic and content audits. really wish they'd provide more tools though as the organic channel is becoming more and more opaque as Google does too. Recommendations to other buyers: The guys at Moz know what those working in the organic channel want and need and the toolset is fantastic. It's a little expensive for what you get and the little extras don't add much value (followerwonk?) but the core product works great. If you're looking to monitor organic closely, this is the tool for you. Comments: I've used Moz across several roles in the last 4 years and found it to be very useful. My favourite tool from Moz has to be Open Site Explorer, which is great for getting a quick overview of the authority of a website, with data to back this up which mainly comes from backlink profile and social shares. This tools allows me to dig into my backlinks, checking the authority at domain level & page level, along with a spam score which is useful when looking to identify low quality links. it can also be used to compare link metrics with other websites, which is great for discovering new links. I have to say, I've never been a huge fan of using Moz for SEO campaigns, as a lot of the suggestions that were being made to optimise my pages were very basic. However, it looks like they have made a lot of changes since I last used it, providing more of a dashboard approach which is good for getting an overview of a website. Pros: I've used a lot of SEO tools out there and still am, but the guys at MOZ have a big team that focuses on everything that you need to get your SEO up to par and then beyond. Features a plethora of tools to review your website with weekly rescans to make sure that your website is operating as well as it can. With help of all the tools I managed to get my domain authority from 31 to 59 in about 3 years. Still ways from a 100, but we wouldn't be where we are if it wasn't for Moz. Cons: Over the past 3 years that I've been using it, they've removed some tools that I did use and more tools are soon to be removed once again. In their defense, they do try to provide a substitute but for the steep price that they charge, if they send you an email saying "hey, we just removed this tool from our system, but if you still want it, you can get it for a discounted price of XYZ", no matter what XYZ stands for it feels like it's XYZ too much. Pros: Moz is a great SEO tracking tool for beginners and intermediates, though more advanced SEO experts may want to look elsewhere. 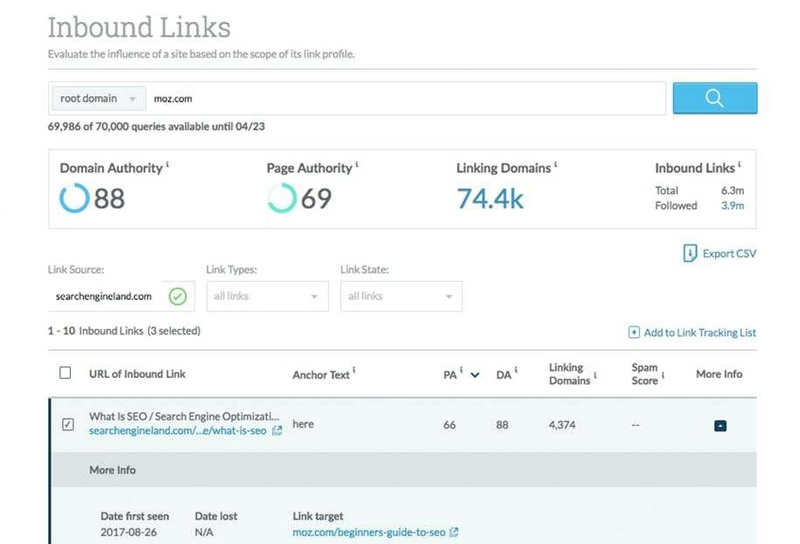 The best features of MOZ include: 1) Open Site Explorer - This allows you to monitor and assess backlinks from your site and other competitors to monitor their quality. 2) Keyword Research - one of MOZ's key features is keyword performance and tracking as well as research. This feature works great for keyword tracking. 3) MOZBar - The ability to add a MOZ toolbar to any browser to track metrics on the fly is one of the best features of MOZ. Domain Authority, Page Authority and backlink quality can all be assessed without opening the MOZ website. 4) Site Review - While not the most comprehensive, MOZ's site review gives you key pointers on things that you can do to improve your sites SEO and some good SEO practices. This is helpful if you need to review several sites to see what their SEO score is. Cons: My biggest con with MOZ, is that it has fallen behind other SEO tools in terms of crawl depth, SEMRUSH for example crawls more pages than MOZ and it is just a keyword research tool. As a result, as an SEO you may find the metrics you are getting are not as detailed as what you would find on other tools. Pros: The best things about Moz are MozBar, the on-page grader, and Open Site Explorer. MozBar is like a swiss army knife for SEO, showing you all the key on-page elements in just one click. The on-page grader is great for page-level analysis. And Open Site Explorer is almost a must if you're doing link building/prospecting. Cons: As of lately, Moz hasn't been too great at keeping up with the industry. SEO changes at a crazy pace, Moz could do a better job of updating and improving tools accordingly. Pros: Moz Pro a comprehensive SEO software suite with several SEO functionalities in one web-based tool. Moz Pro has a visually-pleasing, non-intimidating design different from the more compact interfaces of other SEO tools (SEMrush*, Ahrefs, Majestic SEO or Raventools). 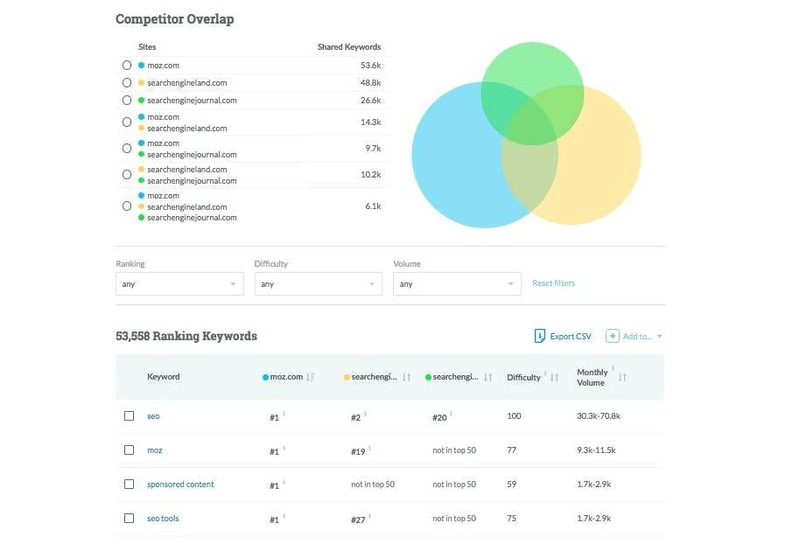 Two strong points are Open Site Explorer and Keyword Explorer, which address the core issues of SEO well Another important factor of MOZ it the fact it has the strongest community behind of any SEO tool, compared to SEMrush*, Ahrefs, Majestic SEO or Raventools. Great, robust SEO tool that can be used by anyone. 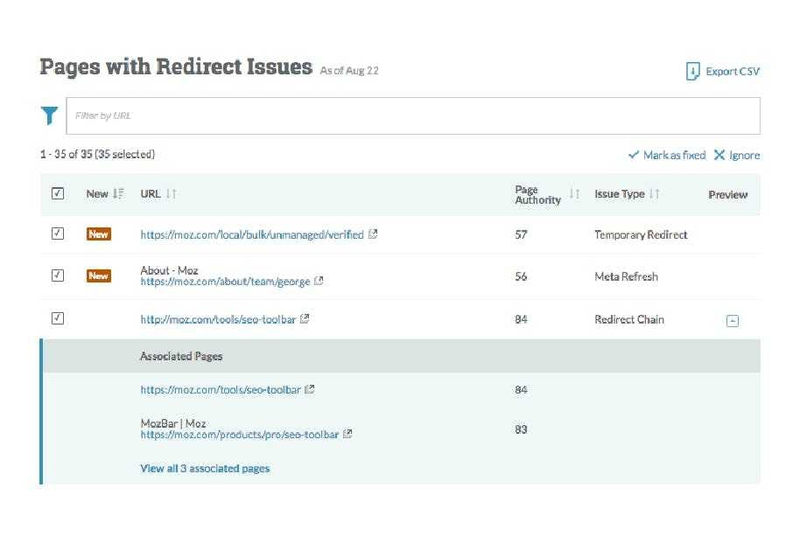 Pros: The variety and usefulness of tools, including position monitoring tool, keyword research tool, site crawler tool, etc., makes Moz Pro appealing to any SEO. The page optimization suggestions are often quite useful and there are extra tools like the browser toolbar extension that are a great bonus. Interface is fairly easy to navigate. Cons: Could be a little overwhelming for people new to SEO/small business employees because of the number of tools and details and the interface is sometimes tricky. Pros: This is a powerful SEO tool that, if you use it right, can provide great value for you if you're an SEO consultant, inhouse SEO consultant, web designer, or business owner. But you're going to need to put in time and effort to learn the tool and how to best use it. Cons: Their index for discovering inbound links isn't as extensive as one or two other link-specific tools, so if you're working hard to track or create new inbound links you probably need to add one of those services to your toolbox. Use MOZ pretty much everyday - would recommend. Pros: Use this everyday to check Domain Authority/Page Authority and to download long lists of SERPs using the MOZ toolbar. Also use the Rank Tracker tool for a quick check on a sites rankings for multiple keywords. Cons: I could be using a lot more of the features, but find it difficult to navigate as there's too much! Definitely doesn't flow as well as it should. Overall: Really great tool that all SEO's should be using! The MOZ forum is also great to get expert advice on any problem areas you're experiencing. A complete tool to monitor and improve the SEO strategy for your projects. Pros: What I like the most is that is pretty easy to use. I've been using it for a year and my experience is quite good so far because it offers lots of functionalities and it adapts well to different projects. It offers lots of Keywords indicators that allow you to take better decisions. It also gives you advice, new ideas and ways to improve the SEO with keywords. Moz is also really useful analyzing your competitors because it tells you how strong are your domain and your website, based on numerous parameters. Cons: Pricing is a bit expensive. It's not very accurate in terms of your rank. I mean, it doesn't tell you the exact number where you are in the search results, it only tells you the range where you belong. It also has limitations on the number of competitors it allows you to compare. This depends on the pricing. It doesn't give you immediate feedback on the changes that you make, you have to wait at least one week to check the results. - Always coming out with new features and functionalities. Overall, I love this product and, when I started my now job, insisted that we get a subscription. Cons: My SEO friends and I go back and forth on this, but we have a hunch that Moz's data -- for keyword volume at least -- is way more conservative (and possibly less accurate than) SEMrush. To be honest, I usually use SEMrush for search volume estimates, but Moz for comparative analysis / tracking our position in search. Pros: Campaigns. We use this to monitor each folder/section of the website. We have set up each one by tagging the keywords we have optimised the site for by folder. Also, the blog is great for industry insight. Overall: It is great for showing visibility in search and stopping people purely focusing on keywords. Optimising the site comes through various tactics and this tool shows our best options. Pros: Moz Pro is easy to use. I like using this product for back link research, competitor insights, domain authority, rank tracking, as well as local listing audits. Cons: The keyword research tool can be a bit wonky, and it often fails to load. I also wish that there were more customizations available for reports. Overall: Super easy to use, particularly the backlink research tool, competitor analysis and domain authority tool. Pros: Easy to set up my site and start tracking my rankings, keyword positions (local and national) , site traffic, back-links and so much more. I love the fact that it keeps me up to date on any site issues that I may have as well. Cons: The "traffic from search" feature would be a lot more useful if you were able to easily determine the actual search terms used to find my site. Pros: I love how easy it is to search for and analyze potential keywords, and then easily add them in and monitor the results and movement of how pages with that keyword are ranking. The analytics and results that Moz provides are very detailed and helpful. It's easy to spend an hour every week making sure we're as optimized as possible. Cons: These seems like something silly to complain about, but I almost feel like Moz has too many great features. They're all useful features, but it took me a while to figure out all of its functionality when we first got started. Once I figured it out though, it's been a lifesaver. Overall: As an inbound marketer, Moz makes it easy for me to bring in more leads through Google search. A good chunk of our leads come from landing pages with forms, and the higher those pages rank from the keywords we enter into Moz, the more likely we are to get more marketing qualified leads in the door. It helps make my job easier. One of the several good SEO tools out there. Pros: MOZ have created one of the most recognizable metrics in the SEO world - "Domain Authority" or DA. It is something that every SEO specialist looks at when evaluating a website or backlinks. Their browser toolbar is a good feature. Cons: Relatively small database compared to other SEO tools like MOZ. They don't have a toolbar for Firefox browsers. Pros: The best parts are their Open Site Explorer and Keyword Explorer. I use it pretty frequently to check for backlinks on client sites, and once you're needing it pretty often it only makes sense to pay for Moz Pro. Keyword Explorer is super helpful for improving relevance and structure of website copy. Cons: Definitely an emphasis on SEO over PPC or other functionality, but for me, this wasn't a big deal as that is my preference anyway. Overall: I really like it and think this would be beneficial if you're working in SEO at all. While that's not the focus area of my business, I've found it helpful both personally and for client work. Moz is not super technical so it's easy to get up to speed and using it quickly. Pros: Moz Pro is not incredibly expensive as SEO/SEM suites go. Moz provides excellent domain authority scoring capability. Also, keyword research is a large part of the offering, with the ability to find keywords based off particular pages and more broad themes. Cons: The interface is not user friendly, and finding certain functionality can be difficult. Everything is organized in 'projects,' but it is sometimes difficult to navigate between them quickly and there is no comparison functionality. The site auditing is also surprisingly poor, with inconsistent results across different time periods and sites. Overall: Moz provides the building blocks for an SEO/SEM program, but it will not/should not be your primary source of research and is not your be-all, end-all. Certain functionality, like domain authority, is top notch, but there are also a lot of missing insights or reporting that is less than stellar. Moz pro keeps up with the constantly evolving SEO industry. Pros: Moz pro is an exceptional SEO tool. It is so beneficial to have access it's indexing. It is the first tool I check to understand a websites authority. They coined the term "domain authority". They keep their index up-to-date and publicise each new index. I'm never worried about getting out dated data. I can also trust that their tools will always be on the cutting edge of new trends and processes. Cons: Their keyword research tool seems to be lacking to me. For me, it hasn't been great at helping me with keyword research or even checking for accurate search volumes. 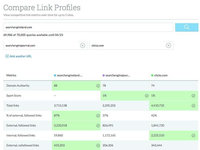 Overall: Best back link assessment tool on the market. Pros: SEO Moz has helped me create SEO powerhouses in many industries. Their tools are incredibly useful and easy to understand. Whenever you do not know how to use something, their customer service team is incredible with helping and they get back to you right away. I have been in marketing for many years and I would highly suggest marketers and business owners to use this tool. Cons: Sometimes there are so many tools to use that you can forget about some of them. We are fortunately to have a few team members on marketing so each member has specific tasks they pay attention to in Moz. Overall: This helped our Organic search grow tremendously with some very hard work. Pros: Moz (aka SEOMoz) is a great tool for SEO work, its user-friendly interface, fantastic features and thought leadership. I love the Keyword research competitor backlink analysis, tracking your rankings over a period of time, SEO audits that help you optimize your pages and finding linking opportunities are really a boon to work with efficiently. The reports & their customization is a good feature which helps you make custom reports & add comments. Cons: This is definitely not for a novice - there is a lot of subject matter you need to know for using the tools, but once you know the subject matter the user interface is easy to navigate & get what you want. The site sometimes seems slow & non-responsive - but I am told it's because it's crunching truckloads of data which makes it look slow. Another thing that I have come across is that for some sites that data seems dated & not fresh - wish its updated frequently. Overall: Its a great tool for SEO - you cant do without it. Moz Pro is a great tool to have in the SEO Toolkit. Pros: Ranking reports and crawl frequency are my favorite features of moz Pro. The keyword research tool is also very functional. Cons: The on page suggestions from Moz are pretty useless, but I can see them being beneficial for people who have 0 experience. Pros: The campaign feature which crawls my website weekly and flags any errors or improvements to me. The keyword research tool is also market-leading. Cons: Sometimes there can be a frustrating lack of data on keyword search volumes in the UK. Pros: If you are setting up your new website or want to improve the ranking of your current website look no further. Moz will help you identify the best keywords and rank by difficulty (low to high competition). The possibility of optimisation are endless, it's all about you and how much time you can dedicate to it. You need to be constant a diligent in order to really asses the difficulty of your wording and improve your website ranking on search engine results. Cons: No issues. It is a great software comparable to its pears. Comments: Moz Pro is the ultimate go-to place for any internet marketing agency or individual in marketing. They offer some free tools, but the value is in the tools included with the pro package. Ability to ask questions and get help from others in the community. Outstanding blog and White Board Friday topics and insights. Love Moz!!! Great web-based tool to manage your website's SEO quality along with that of your competition's. Pros: Ease of use. Interface is intuitive. Nice to get the recommendation opportunities for improvements. Cons: It's a little pricey. I wish the data was updated more frequently. It would be nice to easily add more competitors to track. Pros: MozPro offers a deep dive into our organization's website analytics, and our organization couldn't do effective digital marketing without this subscription. 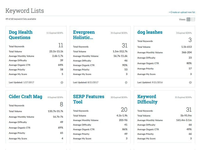 Moz offers a wide range of analytics, including keyword research and backlinks. Not only can we look at our own analytics, but with Moz, we can also research our competitors. We can see things like our competitors' top keywords, best backlinks, etc. MozPro is also great for finding opportunities for backlinks or keywords that will help us outrank the competition. Cons: It can be a little difficult when first getting started, but Moz offers ongoing training, one-on-one demos and an annual conference. Overall: It informs all of our digital marketing. Pros: They have a lot of features wrapped up together like rank report, site analysis, competitor tracking, and backlink analysis. Cons: The price can get pretty high as you add on more sites to track. It would also be nice to be able to split up your billing so you could apply X amount to one card and X amount to another. Specifically thinking about when I want to charge client card instead of it all going on ours. Overall: As I said before, it pretty much has everything an internet marketer needs in their kit for client analysis. This belongs in your kit. Pros: Wow...this tool has so many features, I wouldn't even know where to start. 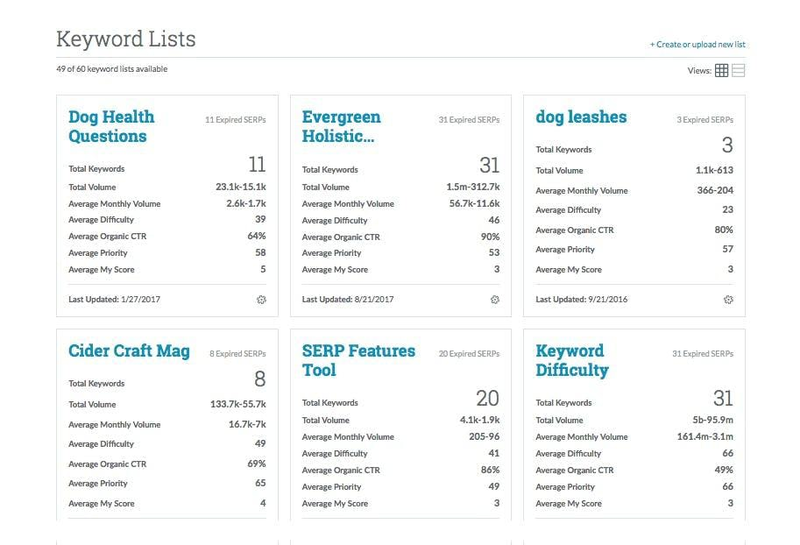 A really great tool for competitor analysis, complementary keyword research and overall lessons about growth hacking. Cons: The main trouble IMHO is the price; there are other options out there, from SEMRush to ZEFO, and in my home country, ZEFO is the undisputed king and the prices are just better. When ramping up, there isn't a need to start with MoZ because of that. Overall: Main benefit would probably be its blog; it has taught me almost anything I needed to know about SEO, growth hacking and ASO. I LOVE Moz and everything Moz has to offer! Pros: What I liked most is how much extensive information Moz Pro gives you. The interface is super easy to use and so is setting up your campaigns. One of the best features has to be the Moz Bar plugin that you can download for Google Chrome. Cons: I dont really have any cons for this software. Everything so far has been great and very very useful. Definitely one of the best in its category, which is why we've stuck with it. Pros: My precise, and we love that we get fresh feedback and data daily. Makes it much easier to stay on top of things, especially since the web changes by the hour. Overall: The most critical and immediate things about our sites that we need to update to keep our rankings high. Comments: Moz is one of the premier pieces of SEO software available. Moz Bar is a great plugin that lets you view Domain Authority (and other metrics) for almost any site on the web straight from your browser. Open Site Explorer is great for looking for linking opportunities. Pros: There's a reason MOZ is the most widely used tools for SEO agencies available today, quality. The MOZ interface is clean, easy to get started and even easier to use on a daily basis. Small business owners can also benefit from MOZ's pricing structure. Cons: With the amazing list of tools and easy to follow tutorials, there's no Con worth mentioning. Winner all around. Overall: I would recommend MOZ to anyone looking to improve their search engine rankings or agency results. A complete pleasure to work with top to bottom. Pros: The biggest feature I use and like is the keyword research tool. It's easy to use as you search keywords you can add them to a specific keyword list to download later. I also like that it gives you an overview of search volume and difficulty so you can see at a glance if you have too many keywords that are too low in difficulty score, too high, etc. and need to balance it out more. Cons: I think the competitor analysis of keyword research is harder to do on Moz. 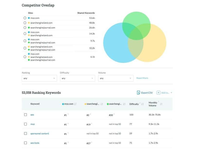 With Moz you can see the domain authority of your company compared to competitors and their link strategies, but don't get as much insight into what keywords competitors are ranking for. Overall: Overall, I really like using Moz. I mostly use it for keyword research, but I'm just starting to use some of the other features like the Rank Tracker and creating campaigns to monitor. I'm excited to get to use these more! Overall pretty happy with using MozPro. You do need to have a solid understanding of SEO basics. Pros: Relatively easy to set up and use the platform. 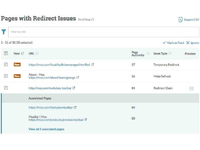 Their site crawl feature is great at identifying issues that need to be resolved. They provide great tips on what each tip means and what impact it will have. Like any tool you need to spend time to set it up properly. It's a very powerful tool once the right foundation is in place. Cons: Their onboarding isn't great. I've tried to get a new team member to go through their new account onboarding & they tried to charge for providing this training which almost made me cancel our plan. Overall: Helps identify areas of our website that need to be optimized for SEO. Also helps us benchmark against our competition. Also very useful for tracking backlinks to our website. Pros: I never knew I could have so much information on my competitors through it! It is like a roadmap to where you need to be in order to be findable on search engines. This is what I liked the most. Cons: Like with everything, you need to know exactly what you are looking for or you'll get lost. This is such a powerful tool that you can do so much with... so it's easy to get lost in the features. Just focus on what you are looking to get from it and you'll be fine, though. Pros: I really like how this software has helped my company track keywords and check out the quality of backlinks. For our use, looking at what our competitors are doing and how we are ranking against them has been the most positive. Not having an SEO background and being self taught, MOZ has been useful for us to get information that we can interpret ... basically their dashboard and layout is intuitive and gives good descriptions as to what all the information relates to. For the price it has been overall a good investment for our company. Cons: The cons are probably on me and my lack of knowledge, but at times it does feel like there are falling behind the industry. That being said, SEO changes so quickly that I can imagine its hard to keep up with at the rate that it changes. Pros: Moz has been our go to SEO tool for over 5 years. We use the Link Explorer, Keyword Explorer, Open Site Explorer daily. Pros: I've tried various SEO-related tools, as part of my work as a content marketing practitioner. Moz can be integrated into the browser as an extension, which makes it easy to use on-demand. I particularly use it to expose 'no-follow' links on Web pages. This is very helpful when considering the application of backlinks via publishing on sites that enable content syndication. The 'free' MozBar will meet the basic needs of most novice or experienced digital marketers, but the 'paid' version offers many more features. Cons: The tool sometime needs to use browser features that may be turned-off by default - such as 3rd party cookies in the Chrome browser. The user interface is okay for many users, but will require some investment in time. Pros: Great SEO, Website and Digital Marketing platform. We use the heck out of moz for crawling, competitive, Link building, etc. Pros: Moz is able to track all 5 of my sites, which is a better bang for the buck than other tools. It has a robust amount of features including keyword research, page recommendations, and many others. Cons: For those who are most interested in keyword research, Moz can only do 300 as compared to other softwares. Pricing is a bit high for it, but it's comparable. The UI is a tad confusing too. Overall: On-page recommendations, keyword research, competitor analysis, rank trackings.